This dog’s left ear is white; she is deaf in her right ear. White color in a dog’s coat is due to hair that does not contain any pigment. Not every form of deafness in dogs is pigment-related. However, this is the most likely cause of congenital deafness in Australian Shepherds. 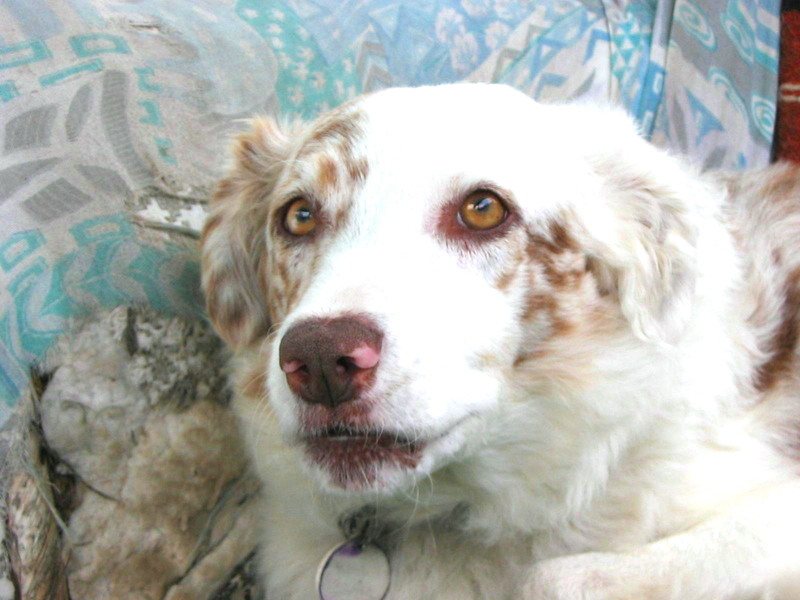 Dogs who have two merle parents and have inherited two copies of the merle gene (double merles) are usually mostly white. Dogs that are not double merles or even merle at all may have half or fully white heads or white markings on or around the ears. White on and around the ear is associated with deafness in many breeds of dog. Most double merles with white on or around the ears are deaf, usually in both ears. Occasionally, Aussies that are not double merles who have these markings will be deaf in one or both ears. The deafness is caused by lack of pigment in the inner ear. The genes which determine white markings impact pigment cells wherever they occur in the body, not just in the coat. White on or near the ears is an indicator that pigment may be lacking in the inner ear as well. Pigment cells play an important part in the process of translating the mechanical vibration of a sound wave into the electrical impulse which travels via nerves to the brain. A tiny organ in the inner ear called a cochlea contains fluid and is lined with hair-like structures called cillia. When sound vibrates the air, those vibrations travel through the ear canal and vibrate the fluid which wiggles the cilia. The cilia connect with nerve endings through pigment cells. These cells translate the mechanical vibration of the cilia into electrical impulses that travel the nerves to the brain. If the pigment cells are absent, this translation can’t take place and the dog will be deaf in that ear. A BAER test will determine whether your dog is deaf due to a lack of pigment within the ear. The affected ear will not always be the one that has white on or near it, as is the case with the dog pictured above..